Why Do Pigs Wallow in Mud? Pigs and mud go together like cats and yarn, dogs and bones, hamsters and wheels. Like yarn, bones, and wheels, mud provides some physical benefits but it is also just plain fun too! Wild pigs were known to wallow around in mud but domesticated pigs seem to enjoy the activity also. Pigs have barrel-shaped bodies which means they are prone to overheating. Mud has been a way for them to cool off. Water evaporates more slowly from the mud making it a long-lasting, natural air-conditioner for them and a good substitute for their lack of sweat glands. The opaqueness of mud also keeps out the sun’s heat and UV radiation functioning as a sunscreen. The physical act of wallowing in mud allows pigs to scratch themselves much like a dog rolling around on the floor. A pig’s short, stubby legs cannot reach their backs, ears, and noses, and massaging themselves in the mud gives them relief. Mud-rolling may be a way that pigs mark their territory with scent glands on their backs. This hypothesis isn’t too much of a stretch – grizzly bears rub their backs against trees for precisely the same reason. Although counterintuitive, another benefit to vigorously rolling around in mud is that it repels parasites. Pigs can rub off fleas, ticks, and lice. By caking themselves in mud, the pigs will also prevent new infestations of bugs looking for mammalian bodies to land on. The simplest explanation of why pigs wallow in mud is that they find it very entertaining. It is one of their favorite things to do. To not provide a domesticated pig with a mud pit is thought to be a form of mistreatment. Perhaps the love of mud is a behavioral instinct for pigs but it is one that keeps them happy and occupied. 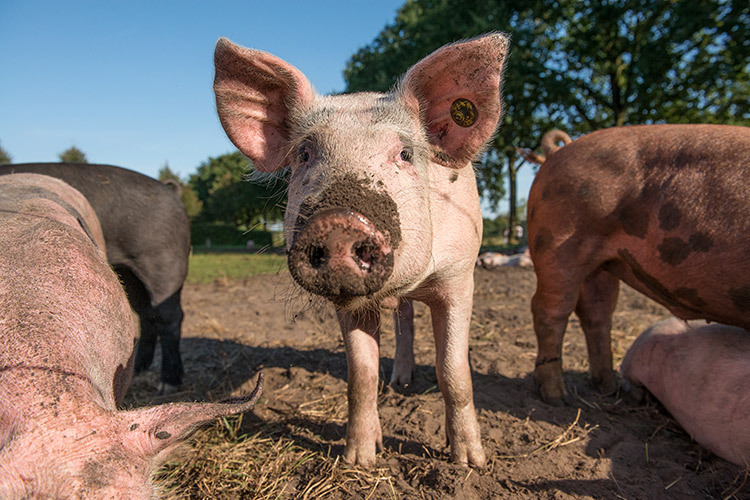 Behavioral abnormalities have been observed and documented in pigs who do not have access to mud even though they are kept in comfortable conditions. Pig domestication and technology have allowed modern farms to use air-conditioned barns to keep the pigs out of the sun and heat. However, without a mud playpen pigs seem to develop other harmful behaviors. They’ve been observed to tail-bite – literally biting or chewing on the tails or body parts of other pigs. This biting can lead to a form of cannibalism among pigs but its occurrence seems to be curtailed in groups where sufficient mud pits are provided. Pigs will roll around in mud pits even when the weather is cold and cloudy, a piece of evidence which clearly indicates that the activity is more than a physical need. They will revel in the mud pit all day – even sleeping in it. Pigs are big and the more you have, the larger your mud pit will need to be. The pit should be about three or four times the size of a fully-grown pig and deep enough so they can partially immerse themselves in it. Pigs may love mud but they don’t like to be infested. Keeping the pen free of feces and rotting food is important to making the pen a healthy play area. Some farms use mud alternatives such as straw but nothing is comparable to the texture and feel of mud. Gabrielle Allemeier volunteers her free time as an animal rescuer and foster pet parent. As an animal lover, she enjoys sharing the knowledge she has gained from her experience with a variety of animals. Along with being an animal lover, Gabrielle is a globetrotter. She lives in Los Angeles, California with her terrier, Thisbe. How Big Do Teacup Piglets Get? What Are the Most Sociable Reptiles? Why Do Cats Like Boxes and Bags? Why Do Dogs Bury Bones? Can You Teach Rats Tricks? Petset is your one-stop shop for maximum cuteness - from adorable cat and dog photos and videos to informative pet-tastic articles, we got it all! We're also a fantastic resource for celebrity pet interviews and pet names for finding that perfect name for you new rescue pet.